The Valencia five-piece dining set is a comfortable and stylish addition to any outdoor setting. The steel frames are complemented with flat-woven resin wicker, adding a touch of style and comfort to the set. With its light pecan color, this dining table with four chairs gives your family a stylish place to enjoy a meal outdoors. The resin wicker and steel frame construction are made to survive the seasons. Add a fun umbrella in the built-in access hole to stay cool on hot summer days. I purchased this 5-piece dining set, a loveseat and an end table from the same collection (Valencia) for our new deck. We love this furniture! It is very good quality, sturdy, beautiful, comfortable -- 5 stars for everything! The furniture arrived packaged well; it was easy to assemble; it is very comfortable -- I highly recommend this product! the chairs did not fit under the table. so you are not comfortable eating there. You are leaning up. We have a small deck and were finding it difficult to find a small scale set in big box stores and local outdoor furniture stores that didn't look cheap. I say this set on Overstock and thought it looked different and would be good for our small deck as the table is only a 39" square - big enough for four people to dine. The set arrived quickly, was not difficult to assemble and is even better looking than I had hoped. We've gotten many compliments and tend to dine outdoors more now. A very good investment. Overall pleased with the set. I am pleased with how easy this was to put together. I am a single mom, and did this while my daughter played next to me in the yard. The connections were all metal to metal, and it fit together precisely wihout problems. My only concern is that i found rust on the bottom of the chair legs, and am concerned this is going to spread. Also, in unpacking one of the chair backs, i again found rusty bits in the plastic bag it came it. So I am concerned how long this is going to last. The table is also smaller than i was expecting, but i guess i should have really noted the size of the table before buying. It looks great, and the chairs are very comfortable. And, I would have preferred if the chairs would fit under the table, which they do not, so you can't tuck the chairs in under the table. It was easy to put together. My Put it together. The only thing is the chairs are not leveled. But they are nice. Great set beautiful for small patios. It was a gift from our children. The weave was broken on one of the chair seats- It was too difficult for us to pack up and return after all the time it took to put it together. Easy to assemble. Just remember the golden rule of put together furniture - never tighten anything until it's all assembled. Nice large chairs although the arms do not slide under the table. That is the reason for the good rating. I liked the color and size and it could accommodate an umbrella in the middle. "Is there a hole for umbrella? What is diameter of hole? Describe required assembly." Hello wattssha, thank you for your inquiry! The table does have a umbrella hole about 2 inches in diameter. The assembly that is required is attaching the legs to the table and putting the legs arms and back on the chair. I hope this helps. Happy shopping! "Is the framing rust resistant? Will it ultimately leave rust stains on my pool deck?" The set is rust resistant. 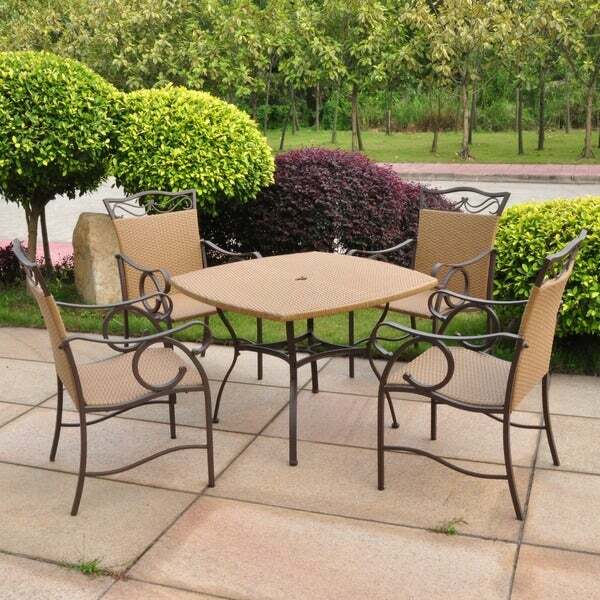 It should not leave rust stains; however, we do suggest covering this dining set in poor weather.